This is a post by Free Homeschool Deals contributor, Cassie of 3 Dinosaurs. ABCs are something you can work on all year long. I know that we are always working on tracing our letters many different ways. 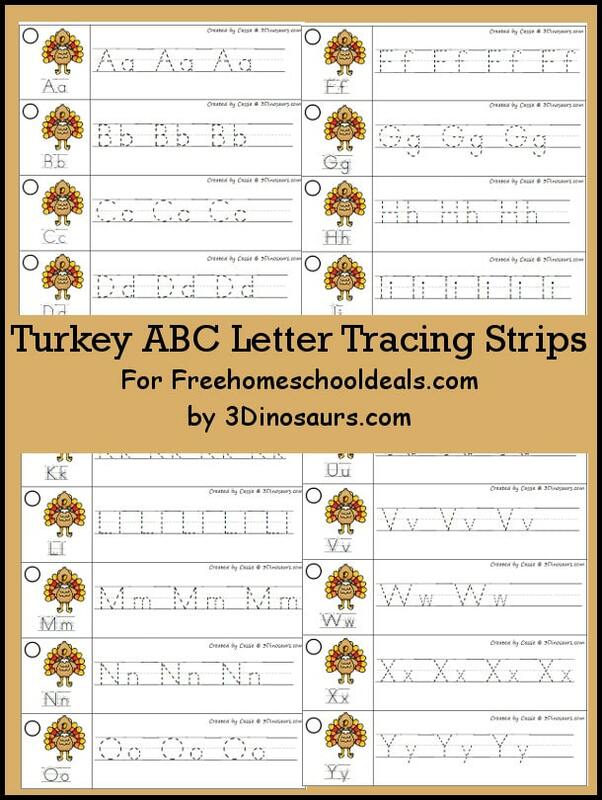 These Turkey Theme ABC Tracing Strips are fun and easy to use for Thanksgiving. The tracing strips work great with my Turkey ABC Finds.. These are great for later PreK and Kindergarten. I recommend cutting and laminating the strips to use them over and over. You can use a hole punch to make a hole in the circle and put them on a ring. It also makes them easy to store.